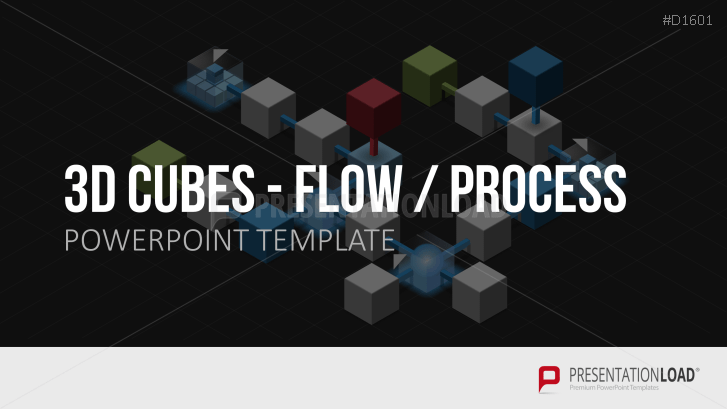 Incorporate this template set in cube design with representations of processes and organizational charts, column and ring charts as well as flowcharts and other structural diagrams for PowerPoint. For this purpose, there are various ways of representing processes from a linked list with linearly arranged nodes to rectangular and round variations. Flowcharts are mostly used in the IT sector in order to show the precise operation of an algorithm. Clearly defined symbols help illustrate the individual intermediate steps of a process such as possible choices or successive elements. By using a network of nodes, one can represent the most diverse processes and structures such as the step-by-step guide to a multi-branched chart. This slide set provides diagrams with nodes in cube design. The spatial design provides a practical side effect of making an array of nodes in all three dimensions. Increasingly complicated processes do not mean automatically using gradually complex and confusing charts. Our PowerPoint set includes a toolbox with individual flowchart symbols as cube graphics that you can place freely. This allows for the opportunity not only to expand our pre-made pattern diagrams, but also to make customized diagrams.